Funny how my last post was about Yoki, too. I took Renee here for the first time on Sunday after our excursion to Portsmouth, NH. 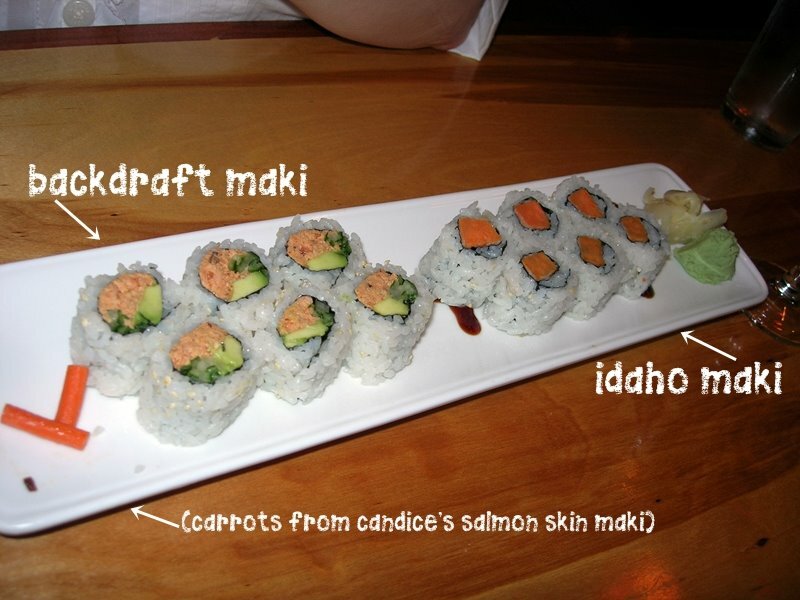 She had the Backdraft Maki (salmon, cucumber, and avocado) and Idaho Maki (sweet potato) rolls. 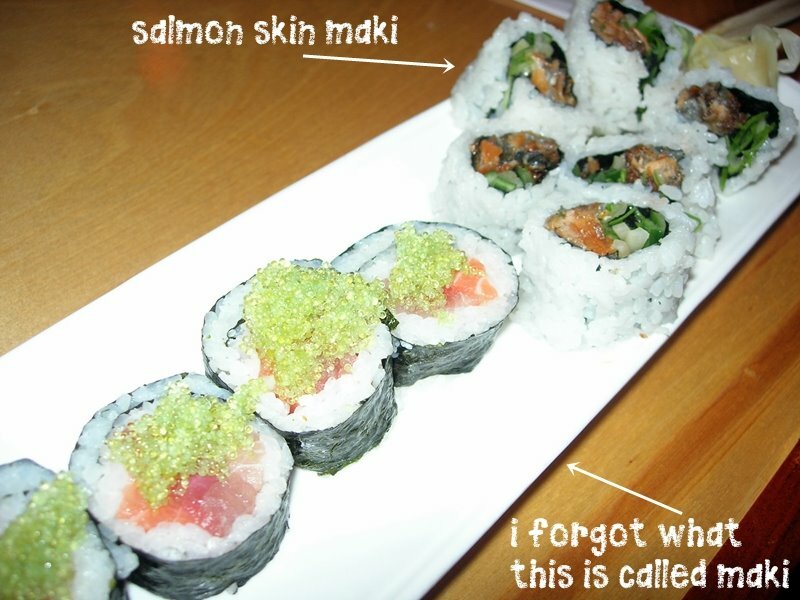 I had a Salmon Skin roll which was really tasty. It came with carrots though, so I pushed them out and gave them to Renee. I also had a roll that I can’t remember the name of, but it had tuna, yellowtail, and salmon in it plus some wasabi flavored roe on top. It was very yummy. We met Mike and Erin at our favorite sushi restaurant, Yoki, in Medford last night. First of all, I am just so happy that we have another “couple” friends that like sushi as much as we do. Second, Yoki is definitely our favorite place for sushi. 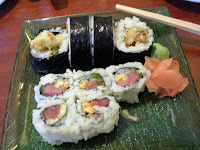 We have never had a bad experience there — the sushi is consistently delicious and the wait staff is super nice. Mike and Erin liked their sushi so I think we made a pretty good recommendation (i.e. there wasn’t a speck left on anyone’s plates). Mike had the Spider Maki (soft shelled crab tempura with tobiko, cucumber, avocado, spicy mayo and sweet soy sauce) which was one of my favorite rolls before I discovered my avocado allergy [insert sad, pouty face here]. He also had the Rock ‘n Roll Maki (jumbo roll of yellow tail, salmon, white fish, avocado, and scallions with sweet soy sauce). A nice surprise is that this roll is fried in tempura batter, too, so it gives it a crunchy texture. 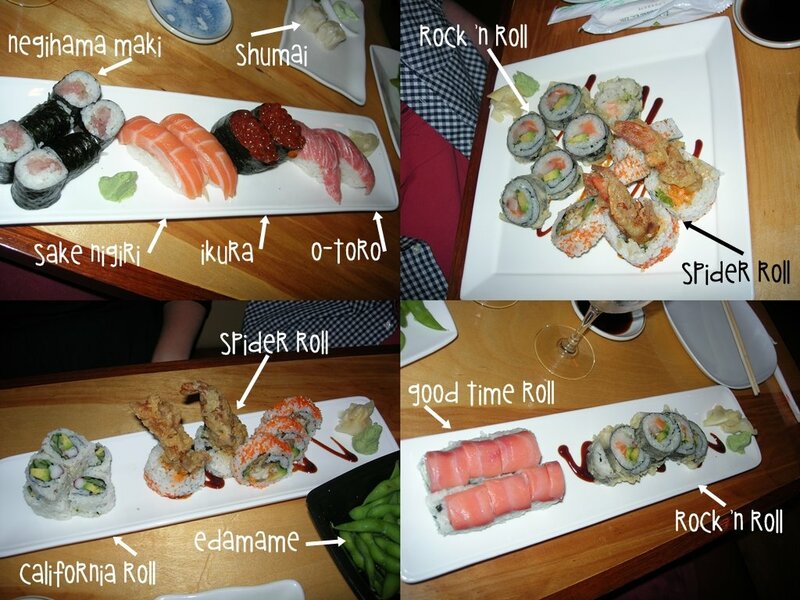 Erin also had the Spider Maki and a California Maki (crabstick, cucumber, and avocado). Tony had the Rock ‘n Roll Maki and the Good Time Maki (cream cheese and cucumber topped with smoked salmon). He thought that the cream cheese taste was a little too powerful but Erin and I thought it was really good. I had a Negihama Maki (yellow tail and scallions roll), Sake (salmon), Ikura (salmon roe), and O-Toro (fatty tuna) Nigiri sushi and it was all so yummy. The O-Toro was something that they had as a special, seasonal item that night and it was super fatty. Super fatty = super yummy! Afterwards, Tony and I went to the Independent in Union Square in search of dessert. We saw my new coworker, Elissa, there with her boyfriend which was a nice surprise. Unfortunately, we couldn’t sit at the bar with them because the place was packed, so we went over to the other side of the restaurant and managed to find two seats there. 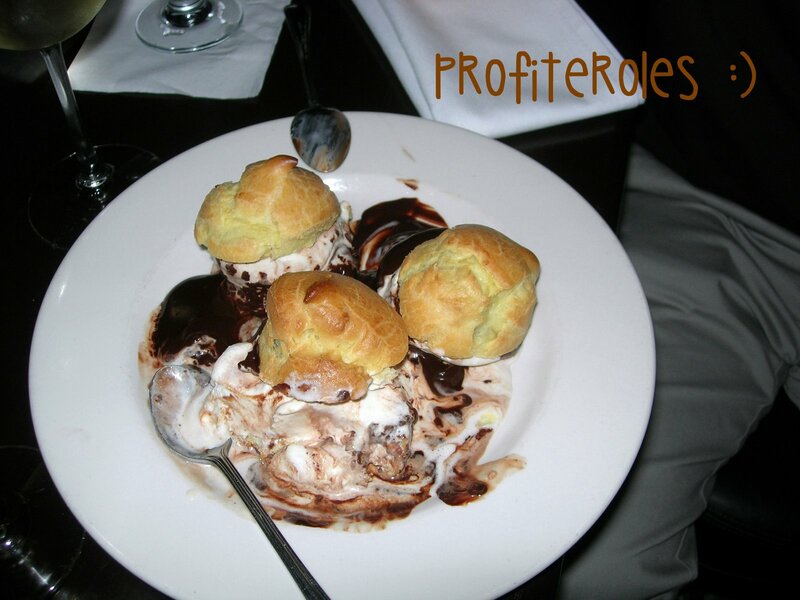 We shared the profiteroles dessert and it was so good! We both ordered a glass of the Riesling wine but Tony didn’t care for it as much as I did because it was more of a sparkling wine and he thought the bartender gave us Prosecco in error. He didn’t hate it because his glass was empty by the time we left. 😉 Anyway, a fabulous dessert and we were so glad to see that the Independent was full of people. 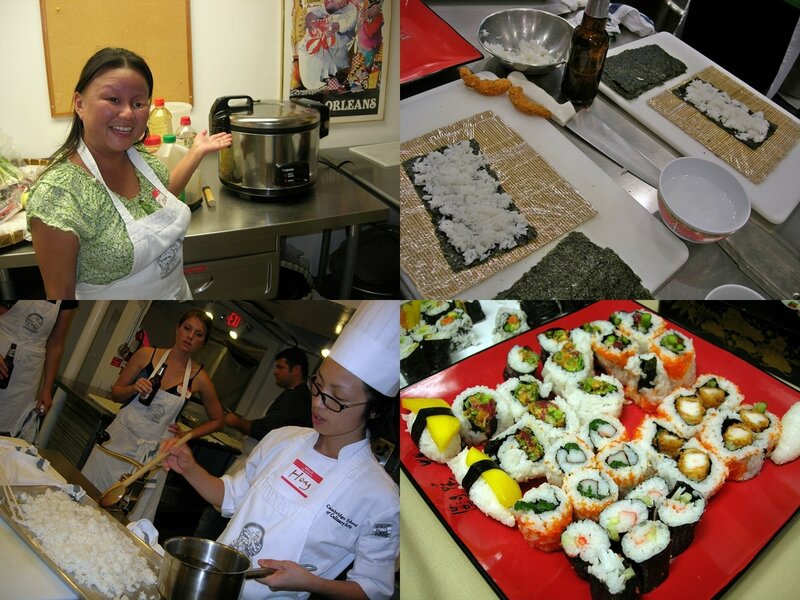 Tony and I took a sushi making class at the Cambridge School of Culinary Arts on Friday night. I had taken two French cooking classes there and wanted him to see what it was like — plus we LOVE sushi — so I convinced him to take the class with me. It was a lot more stressful than he thought it would be, but we still managed to have a fun time learning various things. Our instructor, Chef Hong, taught us about shopping for sushi grade fish, how to roll a couple of different ways, about the various filling options, and — most importantly — how to make sushi rice. We all did the prep work of cutting up vegetables, frying the tempura pieces, and prepping the dessert stuff in groups of two. Tony and I made the components for the dessert pieces — mango with coconut rice and chocolate nigiri — plus made the sushi rice. Then we cleaned up our boards and all learned how to make rolls at the same time. We could use any filling we wanted to which was really cool since I was a little bit worried that I wouldn’t be able to eat much due to my food allergies. We will totally do this at home some time! Doesn’t it feel nice when you’ve had a productive day? Renee, Liz, and I went to visit my friend and jewelry artist extraordinaire, Rebecca Scott, at the Joy Street Studios during the Somerville Open Studios event this afternoon. (This was after I took them to Bloc 11 Cafe for some coffee though.) Anyway, we spent a while gawking at all of Rebecca’s beautiful jewelry pieces and all three of us walked away with something pretty for ourselves. Liz got a beautiful hand wrapped pearl necklace; Renee got a silver ginko leaf (I think it was the new ginko leaf design?) necklace to wear to our wedding (now just to build the dress around that – lol – don’t you love our priorities? 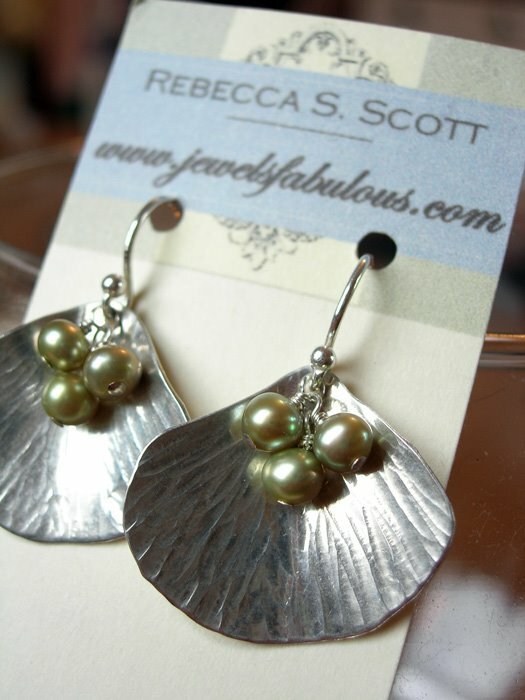 ); and I got this pair of cute ginko leaf and freshwater pearls earrings. I tend not to really wear a lot of jewelry but when I do, it’s usually when we go out. I like to bring her pieces with me on my trips out to see my mom, but I’ve learned that those pieces don’t always necessarily make it back home with me after the trip. So to say that my mom LOVES Rebecca’s work is an understatement. Needless to say (and I think I can post this because I don’t think she or my stepdad read my blog), her Mother’s Day gift was taken care of during this shopping excursion. After that, we drove over to St. Ann’s Parish where our friend, Teeru, was selling her beautiful line of jewelry. Then we drove over to Harvard Square to check out the May Fair, only to find out that it has been postponed until next Sunday due to the rainy weather. We decided to trek around anyway and visited a couple of shops including one of my favorites, Black Ink. 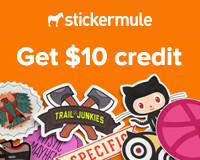 They always have the quirkiest things in there. I found a spring whisk for only $3 and a handy little, fold-up-able, step stool. 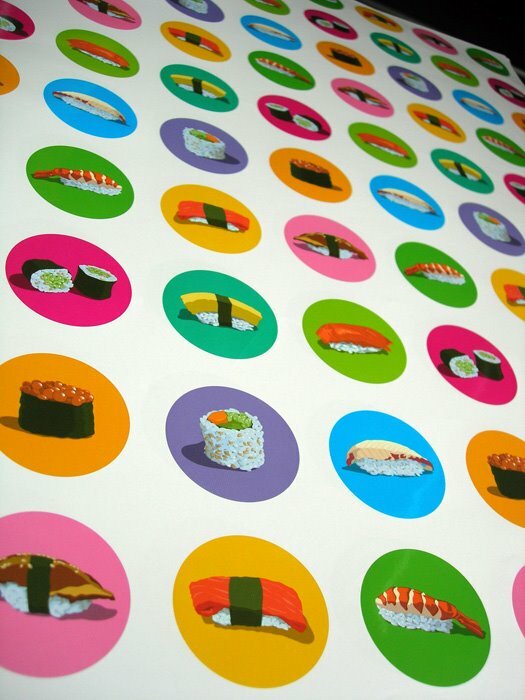 Then we stopped at Papyrus and I couldn’t leave without getting this sushi wrapping paper. Isn’t it funny? I have a couple of card ideas brewing in my head now. 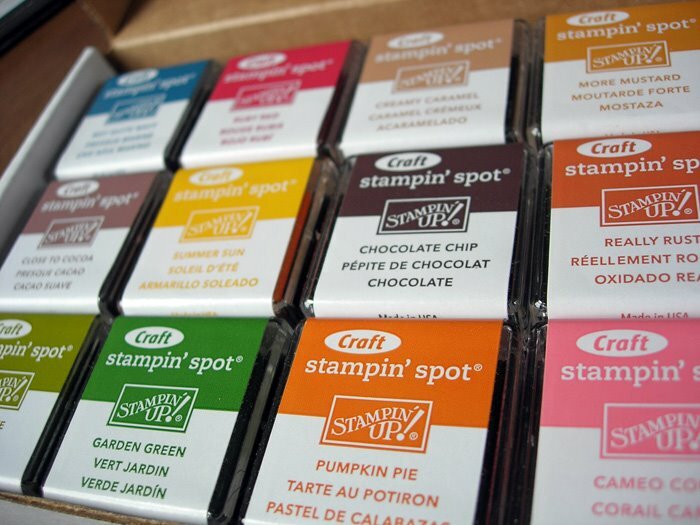 Liz brought over the products I had ordered from a Stampin’ Up party she held at her house a couple of weeks ago, so I had this lovely little box of new ink stamp pads to play with when I got home. 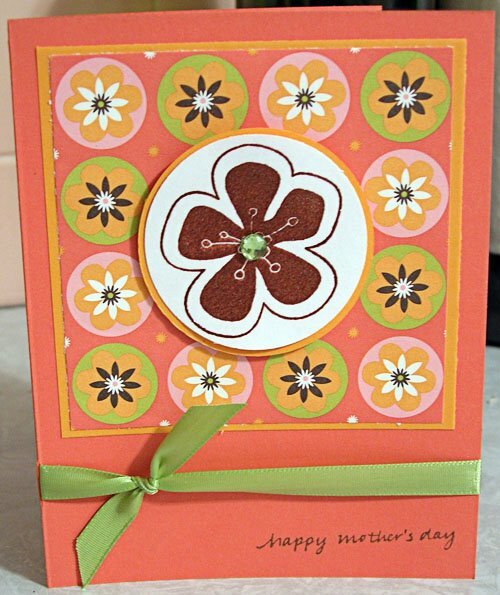 There are 12 of these little ink pads from their “Earth Elements” color family. Basically, I wanted all of them anyway and so it was cheaper to buy the set of 12 small ones rather than 12 of the big pads. 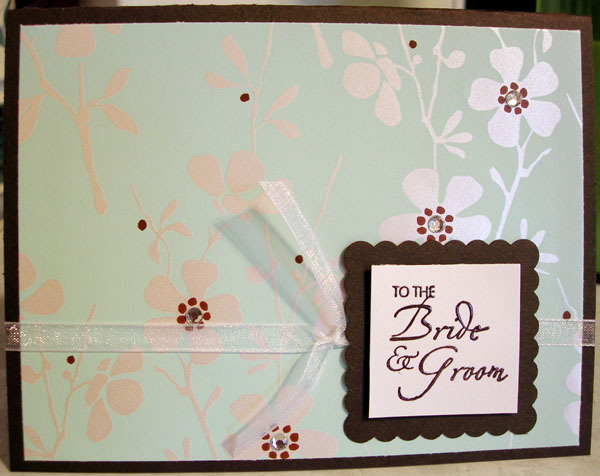 Tonight, I used the “Chocolate Chip” (a really nice dark brown, ya’ll) for the sentiment on this wedding card. Lastly (wow, this is a rather long post), a shout out to my friend, Kate, who did the Walk for Hunger in Boston today. Hope you had fun despite the icky weather! We went out for lunch on Christmas Eve with Tony’s mom, brother, sister-in-law, and his sister-in-law’s mother and decided to check out the new Jae’s Cafe and Grill that recently opened up. There are a couple of Jae’s restaurants here in Boston but we’ve never tried them yet (definitely will after this experience!). Marina and I were really craving sushi so of course, that’s what we ordered. I got the Spider roll with soft shelled crab, avocado, cucumber, spicy mayo and tobiko and it was really yummy. I also really liked the spicy tuna roll, and so did Tony. Tony’s brother had the duck fried rice, Marina’s mom had the coconut shrimp (totally think I’ll order that next time – they looked so good! 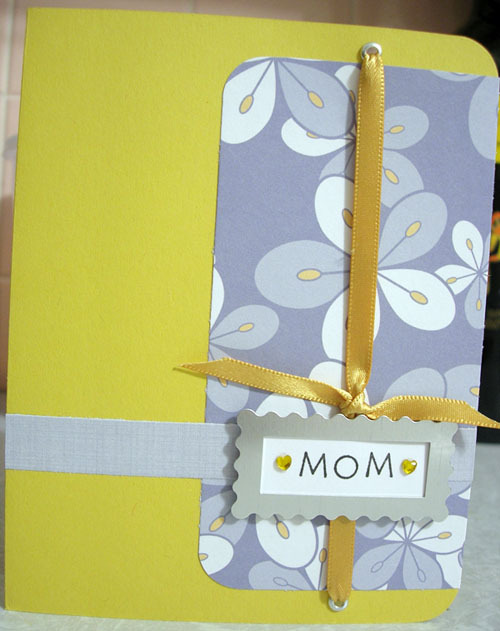 ), and his mom got the mango chicken which he said was excellent (after eating her leftovers the next day). So, I think it’s safe to say we’ll try to venture over to one of his locations in Boston sometime soon. I know this is weird but we all noticed the ceiling inside the restaurant. Kind of cool with the doors hanging off the ceiling like that. And we got loose tea that came in these cute (but hot!) 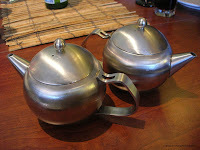 teapots.